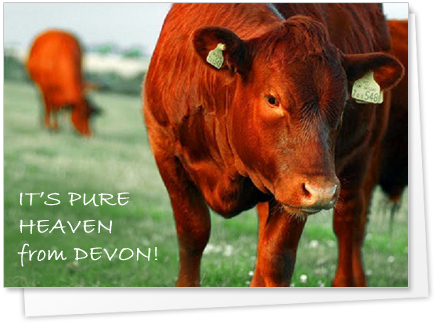 Pure Red Ruby Devon Beef, naturally grown, by us, for you, in the Heart of Devon. All of our beef comes from our own herd of Devons so we know exactly where it comes from and how it has been reared so you can buy with confidence. We hang our beef for at least three weeks on the bone, expertly butcher it and then deliver to your door, anywhere in the UK. It's fresh not frozen, packed, labelled and ready for your freezer or, if you can't wait to try, for instance, some of our gorgeous award-winning sirloin steak - for your dinner! Look at our Farmhouse kitchen page for advice on how to cook the perfect Red Ruby steak. We also sell other things! We make our own dry-cured bacon, cakes, biscuits, sweets, marinades, seasonings, pasties and pies using our own and local ingredients. We also buy delicious things from our neighbours for you such as lamb, pork, free-range poultry, eggs, jams and chutneys, vegetables, clotted cream, butter – in fact anything we can find. Keep looking as we might find something new next week!